DIRECTIONS: From I-95 (North of the Capital Beltway) exit Route 212 (Powder Mill Road) East. Turn left at the first traffic light onto Old Gunpowder Road. Proceed approximately three (3) miles to pool on the left. FACILITY: 50 meter x 25 yard indoor pool. Eight (8) lanes will be used for competition. Eight lanes will be available for continuous warm-up/warm-down. Colorado Timing System with a scoreboard and Competitor racing lane lines. The meet director reserves the right to use nine (9) or ten (10) lanes for competition during any session or individual event. Two 8 lane courses will be used for the 1650. Swimmers are responsible for providing timer and counter. 1650 Free (Events 23 - 24) will be swum slowest to fastest. ELIGIBILITY: Open to all invited teams. Swimmers must be registered with USA Swimming Inc. and should be training at the senior level and be preparing for successful qualification or participation in Sectionals and/or Nationals. Age on November 3, 2007 will determine age for the entire meet. Swimmers younger than 13 will be excluded from this meet. No on-deck registration will be permitted. RULES: The 2007 USA Swimming Code and Rules will apply. Potomac Valley Safety and warm-up procedures will be in effect. 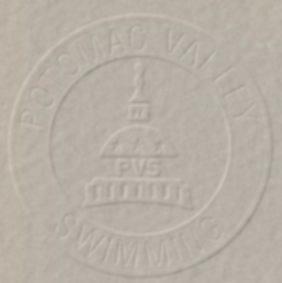 In accordance with Potomac Valley Swimming Policy, only those coaches who, at all times, clearly display current, valid USA Swimming credentials will be permitted to act in a coaching capacity at this meet. The Meet Director reserves the right to limit entries in any event, if necessary, to prevent too lengthy a session, and to combine events in which there are insufficient entries. INCLUSION POLICY: PVS and host clubs along with their Meet Directors are committed to the Inclusion Policy as adopted by the BOD. Athletes with a disability are welcomed and are asked to provide advance notice of desired accommodations to the Meet Director. The athlete (or the athlete’s coach) is also responsible for notifying the session referee of any disability prior to the competition. WARM-UPS: During Saturday morning warm-up, the first hour and 40 minutes will be general warm-up. The last 20 minutes will be specific warm up with lanes assigned for pace, sprint and general warm-up. During Saturday evening warm-up, 1 hour and 10 minutes will be general warm-up and 20 minutes assigned as specific warm-up. During Sunday (session 4) warm-up, the first 45 minutes will be general warm up. The last 30 minutes will be specific warm up with lanes available for pace and sprint. MEET FORMAT: All events will be Timed Finals. All entry times must have been achieved in USA Swimming sanctioned or approved competition. Swimmers may enter (3) individual events per session but no more than (5) total for the day on Saturday. Swimmers may enter the 1650 Free plus 3 events on Sunday. Swimmers may participate in 2 relays per session. ENTRY TIMES: Coaches should not submit made-up times. 20, 17, 16, 15, 14, 13, 12, 11, 9, 7, 6, 5, 4, 3, 2, 1. Relay events will receive double these point values. SEEDING: All events at the distance of 200 and below will be preseeded. All relays, 400 IM’s, 500 Free’s, and 1650 Free’s will be deck seeded and requires a positive check in. Upon receipt of entries the meet director may choose to swim the 1650 freestyle, 500 freestyle and 400 IM in two courses. Positive check in for relay events are at the following times: 8:15 AM Saturday for the 200 and 800 Free Relays, 4:45 PM Saturday for the 400 Medley Relay, 10:45 AM Sunday for the 200 Medley and 400 Free Relays. Check in for following individual events are: 400 IM will be by 8:30 AM Saturday morning, 500 Free will be by 5:00 PM Saturday evening, 1650 Free will be by 7:30 AM Sunday morning. OFFICIALS: We ask for your teams help in supplying officials for the meet. Any one in the process of achieving certification through on-deck training is welcome. Contact Sue Schwartz at sue_schwartz2003@yahoo.com . Thank you for your help in advance. TIMERS: Teams will be assigned the number of timers based on their entry count. If needed, each team will be contacted as to their assigned lanes for timers by October 27. All teams are responsible for providing timers for their swimmers competing in events 23 & 24 (1650 Free). GENERAL: Swimmer/Spectator Conduct: Each club is responsible for supervising the conduct of its swimmers/spectators. Any swimmer/spectator that violates aquatic facility rules, posted at the pool and in the meet program, will be disqualified from the meet and escorted from the facility. Deck Access: Coaches, officials and volunteer staff only will be permitted on the deck during warm-ups and competition. Spectators must remain in the balcony seating area or in the lobby. Meet Programs: Meet programs will be sold for $10.00. The program will include all sessions. Entries must be submitted in short course yard times by email using Hy-tek Team Manager software. Email the contents of the entry cover sheet that is posted at the bottom of this meet announcement and submit with your entry file by October 23, 2007. Also print and fill out the cover sheet and submit along with you check to the address listed below. Relay teams must be designated A, B, C, etc. if a team enters more than one relay. All entry times must have been achieved in USA Swimming sanctioned or approved competition.